National Tinnitus Awareness Week (TAW) is May 17 through May 23, 2015. While there is no quick solution to tinnitus, there are management strategies that can provide relief. Most patients develop tinnitus as a symptom of hearing loss, caused either by age, long-term hearing damage, or acute trauma to the auditory system. Patients with hearing loss and tinnitus may find relief from the use of hearing aids and other sound amplification devices. Tinnitus is overwhelmingly connected to some level of hearing loss, so enhancing other sounds can often provide relief from the sound of tinnitus. Starkey Hearing Technologies is proud to introduce Relax, a new app to help provide personalized relief to those suffering from tinnitus. Hearing Aids: because most who experience tinnitus also experience hearing loss, ambient sounds can be amplified to cover tinnitus through Made for iPhone® or 900 MHz wireless hearing aids. Sound Therapy:incorporate Relax into your sound therapy program by using sound to decrease the loudness or prominence of tinnitus. 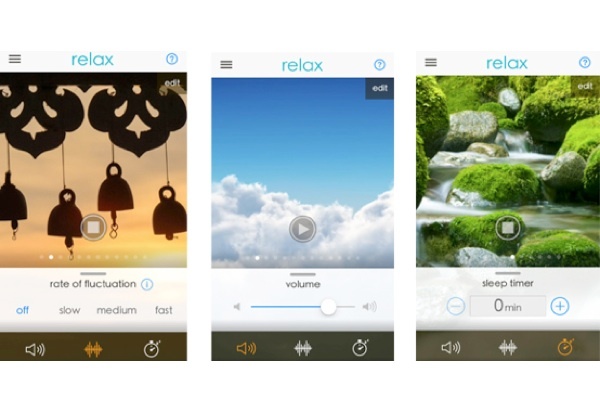 Relax also allows you to create new, customized relief sounds coupled with soothing images to accommodate the changing behavior of your tinnitus. By modifying the volume, frequency response and rate of fluctuation, users can create customized versions for each of the 12 relief sounds unique to their own tinnitus. The app also includes a variety of tinnitus education materials about symptoms, causes, treatments and solutions. Relax works with Made for iPhone hearing aids via an iOS device and also with 900 MHz wireless hearing aids via SurfLink® Mobile. Users who don’t use hearing aids but also suffer from tinnitus can stream relief sounds to Bluetooth® audio devices such as headphones or speakers or can use the app by plugging in directly connective earbuds. Relax supports iOS version 7.0 and later and Android platforms version 4.1 and later. Start managing your tinnitus and get relief today. Call Tustin Hearing Center to make an appointment to get more information about Relax and other tinnitus relief options!